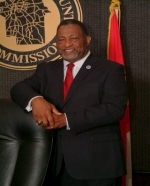 The City of Montgomery consists of a Mayor-Council system of government. Both the Mayor and Council are elected by the people to a four year term. The current term is from 2015-2019. The governing body of Montgomery County is the Montgomery County Commission, consisting of five members who are elected by districts. Each Commissioner is elected to a four-year term and represents approximately 45,000 constituents. The Chairperson and Vice Chair are selected by a majority vote of the Commission.